Recently, Japan has been really innovative about how containers look like. In part, I think they stimulate interest in consumers, making them pick up the product and hence increase the possibility of the first trial. It’s really refreshing to see this kind of innovation starting to pick up the pace in Japan. While flavors and contents of drinks are always changing depending on the seasons, their containers have remained the same for the past years. Only recently that Morinaga has started the trend. First and most exciting innovation would be PREMiL! New concept of milk targeting those in their 40s-60s. There are 2 types of product options: one with fortified calcium and protein but still creamy (in blue color) AND one with added fiber and BB536 bacteria (purple color). And then…Meiji followed suit with this bottle series…called “Shimaru bottle”. Shimaru is to close something – in this case the bottle. They look pretty similar, no? What do you think? Do these new shape of bottle makes you wanna buy more? 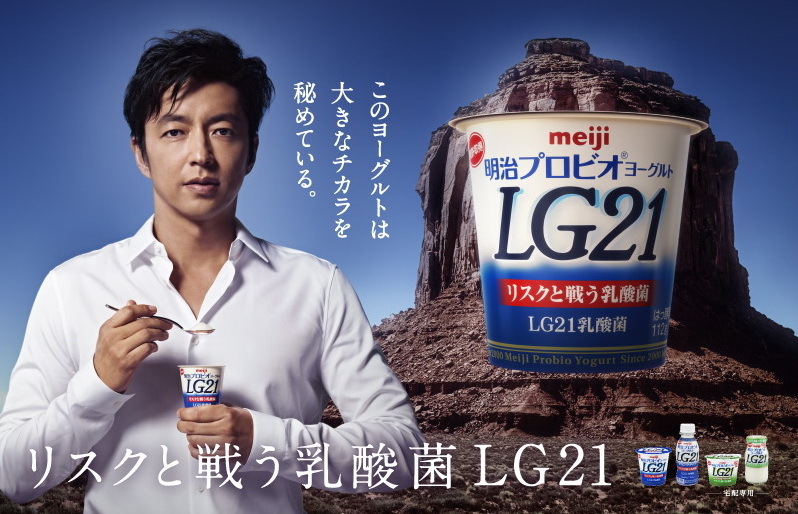 Let’s continue with the probiotic yogurt theme….Also from Meiji, this time I wanna introduce “LG21” yogurt. Similar to the reason for the R-1 yogurt, LG21 is also a name of a bacteria blended in this yogurt, having a full long name as “Lactobacillus Gasseri OLL2716”. To explain simply, LG21 works against another type of bacteria that is said to be a cause of gastric cancer, thus it is said to reduce the cancer risk. From the info on its own website: http://www.meiji.co.jp/dairies/yogurt/lg21, this bacteria was especially picked out from the 2,500 other bacteria species in Meiji’s library. Currently, Meiji distributes this product in 2 ways: normal supermarkets and combini and by online with delivery. There are special packaging (in green) for the latter. You would probably find 4 types of LG21 (the yogurt type): plain, non-sugar, low calorie, and non-fat with aloe added. For the drink type, you would find 3 variations: (plain, low sugar & low calorie, with-aloe). The plain yogurt type is not so sweet but gives a refreshing feeling, not so sticky, and doesn’t leave a tart taste in your mouth. The nonfat with aloe, on the other hand, gives me too-sweet after taste and I didn’t really care for the aloe jelly that much. It tastes good nonetheless.